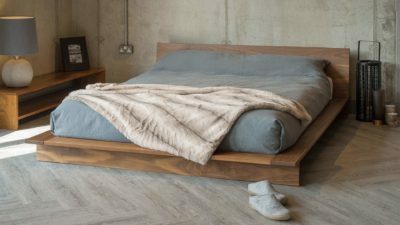 Here at Natural Bed Company we offer a wide range of low beds to suit all room sizes, decors and layouts, from the space saving minimal Kyoto to the luxurious Oregon platform bed. 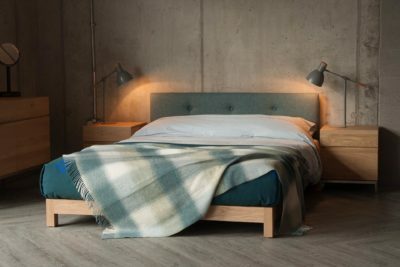 In this blog I’m going to take a look at the most popular bed bases in this range and the best low bedside tables to match with them. 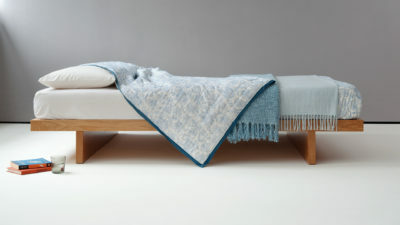 Lets start with the newest low bed design in our collection (and one of my favorites already) – the Pimlico bed. 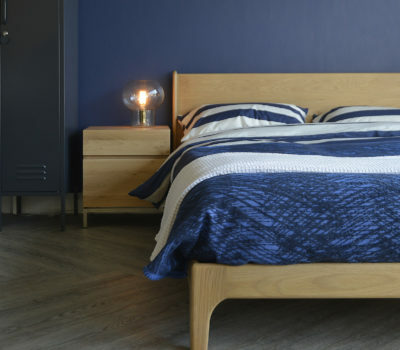 Based on our bestselling Camden bed, the Pimlico offers a contemporary take on classic mid-century design, with soft curved edges on the headboard posts and shaped legs, giving an understated but stylish outline to the bed. 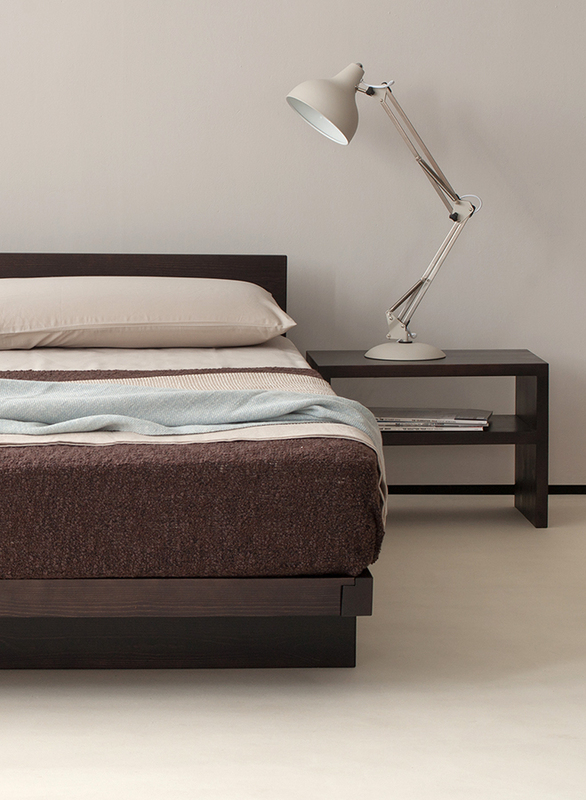 The Pimlico has lower legs and a lower headboard panel than the Camden. 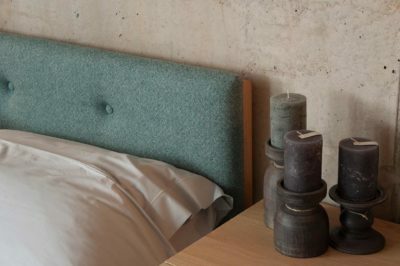 If you like the shorter legs but prefer the taller headboard then take a look at the Carnaby bed. 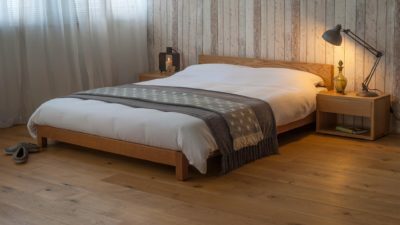 Available in all the hard-wood timbers in our range, the Pimlico is an ideal choice for a loft room or a bedroom with a low ceiling. 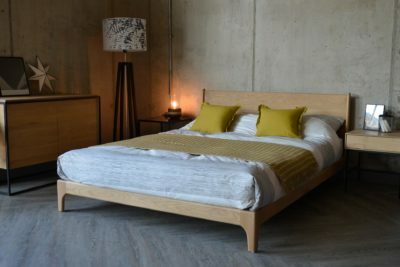 The mix of a low base (22cm to the top of the bed slats where the mattress sits) and a not insubstantial headboard allows for plenty of your chosen timber to be on show without the bed being too tall for the room (the measurement from the floor to the top of the headboard legs is 69cm). 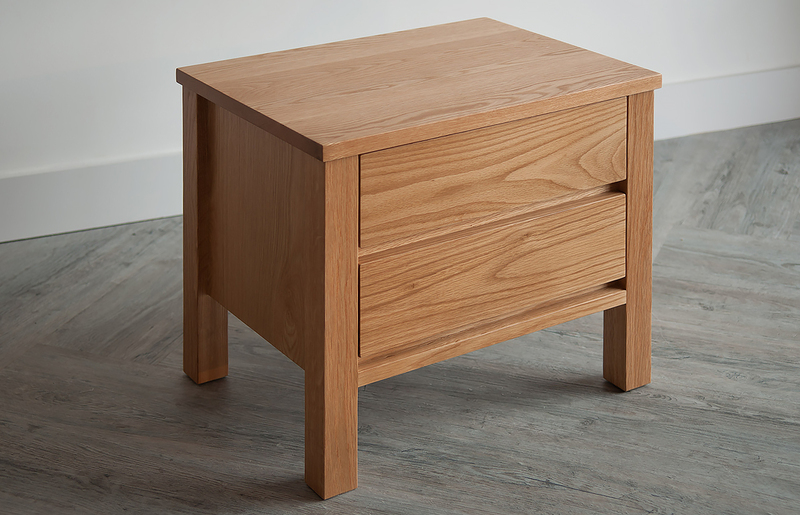 We have paired the Pimlico with the Madra bedside drawer table – the simple minilamlism of the Madra allows the detail of the Pimlico to shine. 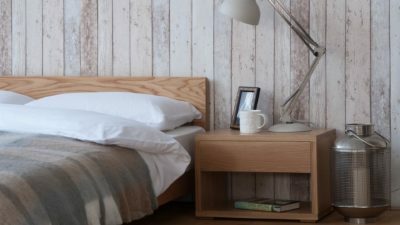 If you prefer a taller bedside unit you may prefer the Carnaby bed – the taller headboard balances well with the height of a taller table. 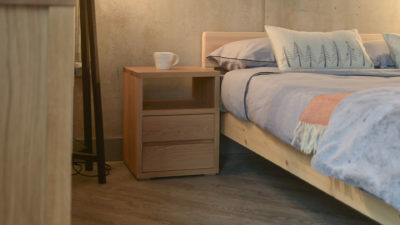 We’ve used shown the Spindle bedside drawer table and the Ligna bedside cupboard with the Carnaby – these elegant oak bedside tables offer useful storage space along with a platform for your alarm clock and cup of tea! 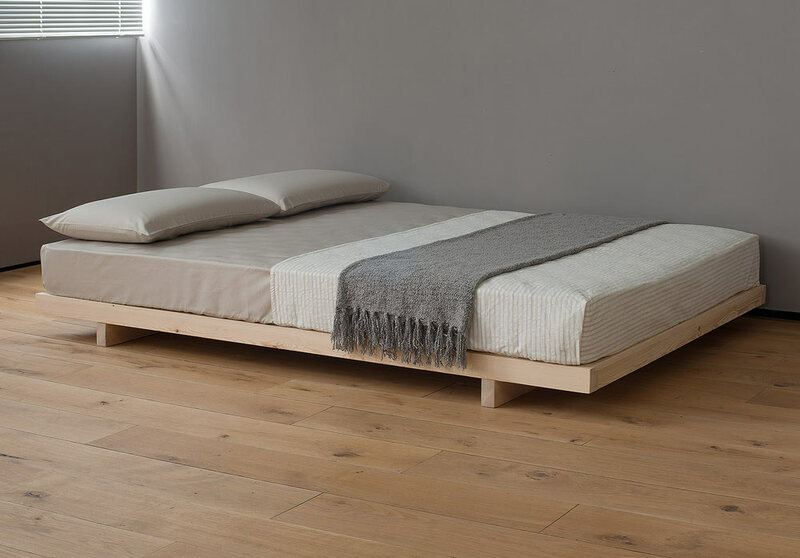 If you are looking for something more minimal in style, with a smaller overall footprint – take a look at our Kyoto range of beds; consisting of the Kobe, Kumo and Kyoto Japanese inspired low bases. 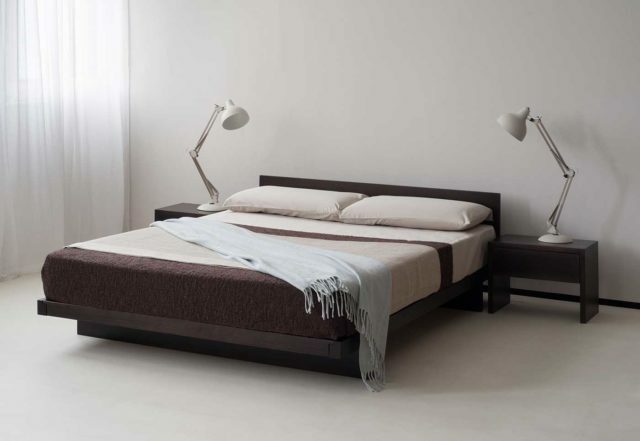 Each bed in this collection is available both with and without a headboard, depending on your requirements. 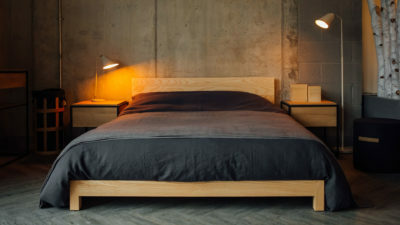 If you are looking to save as much space as possible and reduce the height of the bed, removing the headboard offers the perfect solution. 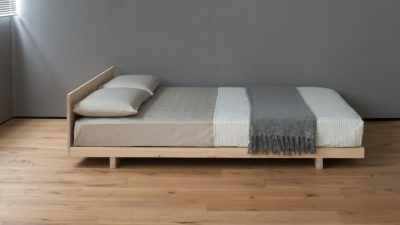 Without the headboard, as the mattress sits on top of the frame rather than within it, you have the smallest possible footprint for the bed base (e.g. 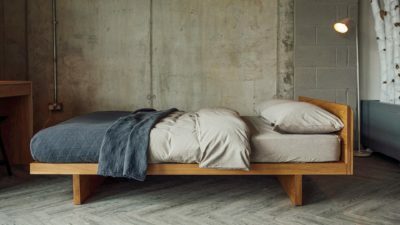 a 150x200cm Kyoto- without headboard measures exactly 150x200cm). 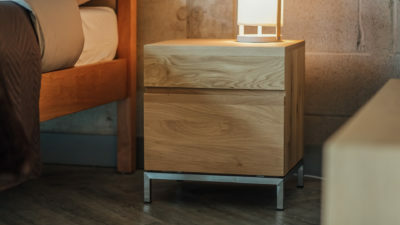 We offer two bedside tables designed specifically for the Kyoto range – the Kyoto Drawer Table and the Kyoto Shelf Table. 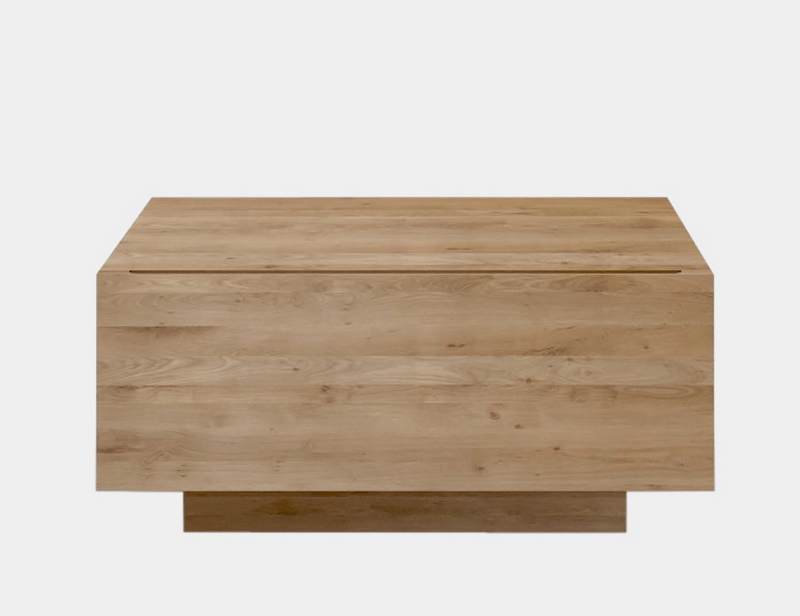 Both options have the same overall dimensions – 32x50x36cm – and you can make the choice on whether to pick the shelf or the drawer based on your storage needs. 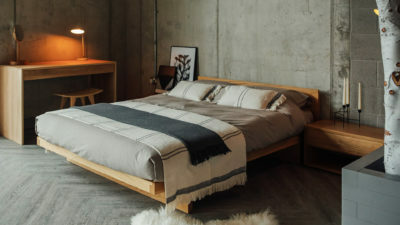 If you have plenty of floor-space but low or sloping ceilings and are looking for an eye-catching design, take a look at our Oregon platform bed. 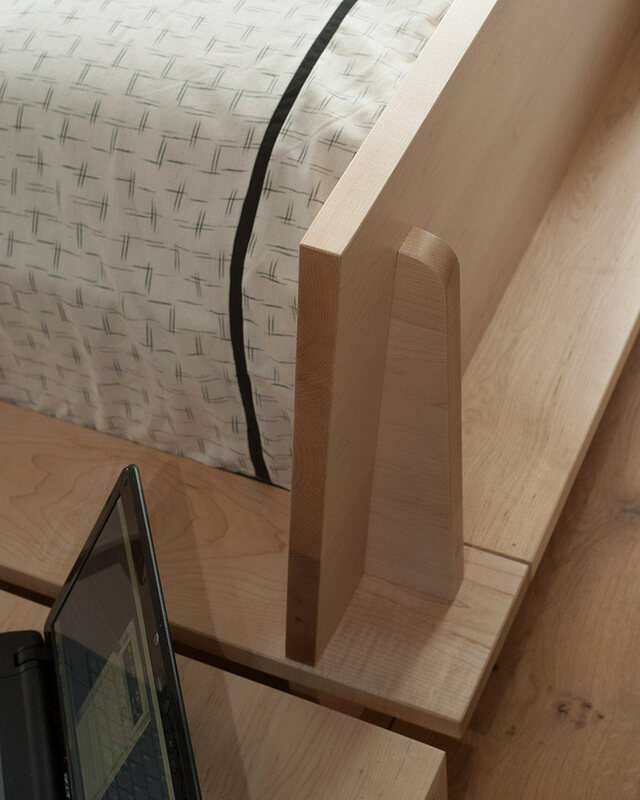 In many ways, this is the complete opposite to the Kyoto collection mentioned above. 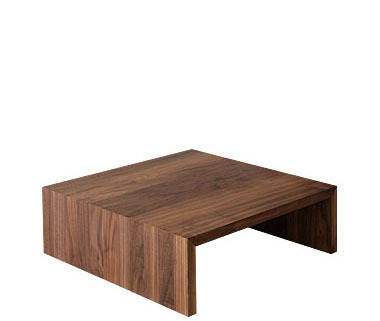 With a large footprint due to the skirting around the base (this adds 30cm to the length and width- e.g. 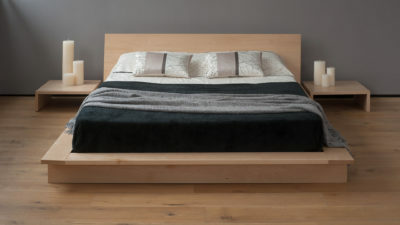 a 150x200cm Oregon is 180x230cm) and a sloping headboard, the Oregon is definitely a statement bed, the perfect choice to show as much of the beautiful hardwood timber you have chosen as possible. 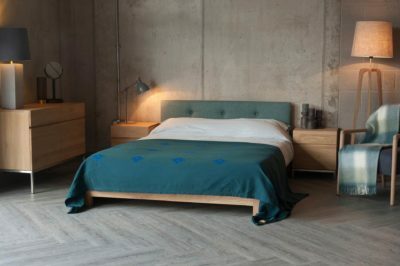 I’ve always thought that the Oregon works incredibly well with walnut, with the large pieces of timber used in the headboard panel and the skirting showing off the swirling grain and variations in tone in the wood to the fullest. 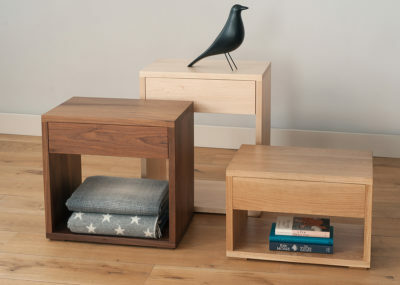 Just like the Kyoto collection, we offer a bedside table just for the Oregon – the aptly named Oregon Table! 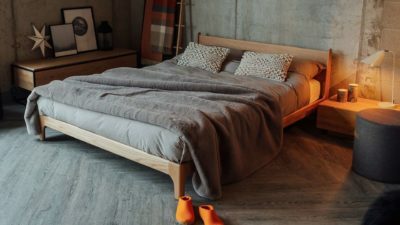 Its simple and elegant design compliments the bed perfectly, its height matching that of the skirting on the base exactly. 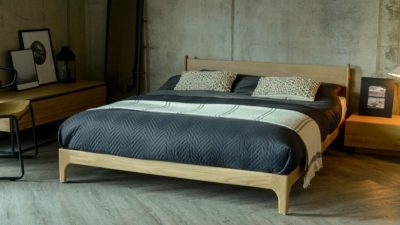 One of our most popular low beds year after year is the Nevada; a simple, minimal but traditional style bed with a small, one panel headboard and low under-bed clearance. 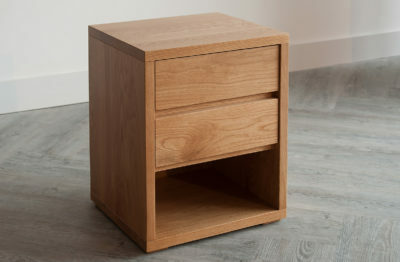 When pairing this base with a bedside table, take a look at our Low Cube Bedside – with one drawer and a small shelf, this table offers the most storage for the least amount of space. 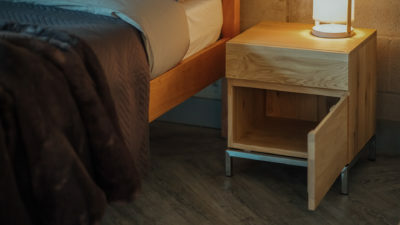 If you need a bedside table with a really small footprint take a look at the Black Lotus Cube Shelf Table (available in oak or walnut) or the Shelfy – a wall-mounted shelf complete with lamp holder. 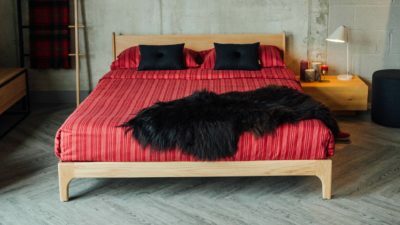 If you prefer a taller headboard, by still want the low bed base, then take a look at the Sonora bed. 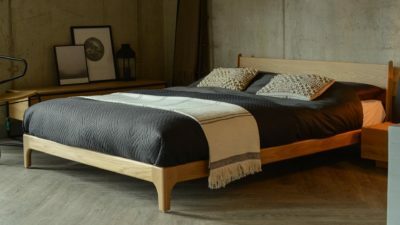 The Sonora looks just like the Nevada – 4 legs, elegantly simple – but the taller headboard panel shows more timber beyond your pillows. 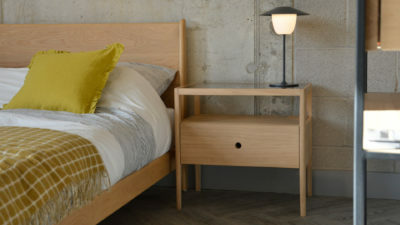 The taller headboard means that you can use slightly taller bedside tables too – we’ve paired Monolit bedside tables and Whitebird tables with the Sonora. 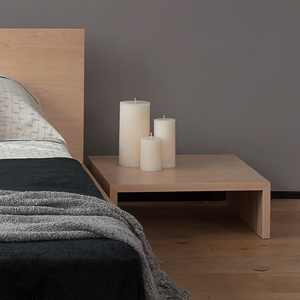 Finally, lets take a look at a low bed from our upholstered headboard range – the Iona. 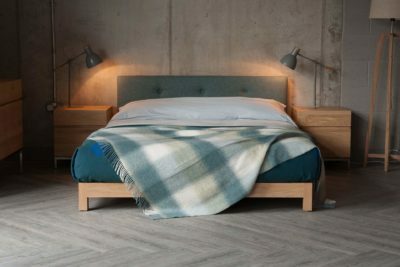 With a padded and buttoned fabric headboard on offer in either the pure wool Parquet collection or wool mix Amatheon and Tailor ranges and a low, simple frame, the Iona bed base lets you mix space saving simplicity with luxury. 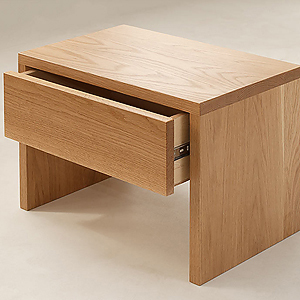 The Iona has similar proportions to the Sonora, so it suits a range of low bedside tables – from the very low Madra table to the two drawer Cube or Shaker bedside units. 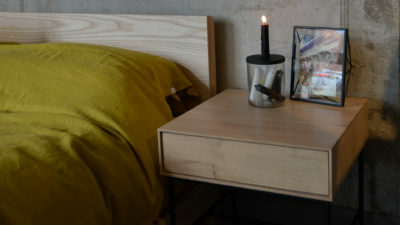 The Ligna bedside cupboard is another good option and is shown with the Iona bed above. 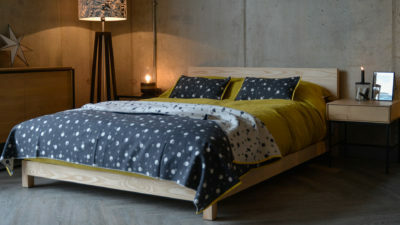 We do offer low beds other than the models mentioned above but I’ve run out of space! 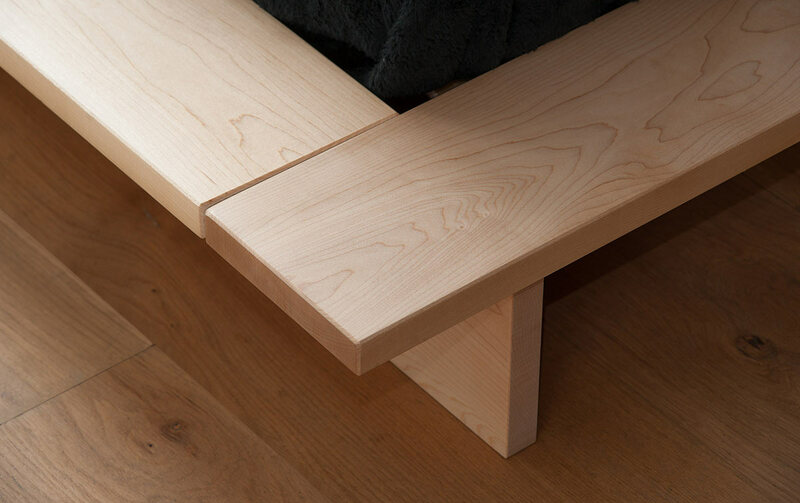 For further inspiration, have a look at our Java, Ki and Kulu beds – three vastly different designs that would all work in a loft room. 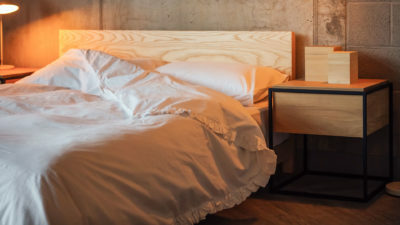 If you have any questions regarding the beds and tables I have mentioned please do not hesitate to contact us either over the phone on 01142721984 or via email at counter@naturalbedcompany.co.uk.